These standard check presenters can be made from turned-edge linen, Ambassador, French Corner or heat sealed materials. All include a diagonal pocket on the inside back cover and a one area hot stamp. Sheet size 10″ x 4 3/4″. 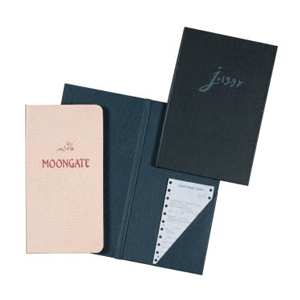 These are standard guest check presenter menus that are used in hospitality establishments. We utilize various materials including turned edge linen, heat sealed materials, Ambassador vinyl, and French corners for design and presentation.